Ran into a fun issue today… I had a pair of Server 2012 R2 servers in a remote office that refused to sync the proper time for their clocks. No matter what I did they were always off by five minutes. One of them was a domain controller for the office. In the process of fixing the issue I learned about an interesting feature in hyper-v that was the root cause of all my trouble. By sharing my experience, hopefully you will avoid the same issues I ran into. Physical Domain Controller in local office running all PDC emulator roles including being the central time server. Time is correct. Hyper-V Physical Host Server running Server 2012R2 located in remote office. Clock is off by 5 minutes. Server 2012 R2 Domain Controller – Virtual Machine running on Hyper-V Host server. Clock is off by 5 minutes. But actually not… There is a feature in Hyper-V I was unaware of that basically allows all of the Virtual Machines to sync their time to the physical host. This feature is set to “on” by default and it over-rules the windows 32 time service (w32time). The clock on the Hyper-V physical host had drifted by 5 minutes. It was set to sync to the client Virtual AD server… which was having its time set by the physical host. And around and around we go. I had a time-sync loop on my hands (not nearly as cool as a quantum “time loop” but perhaps less of a headache). This fix was to disable the “feature” that was causing the VM client machine to sync to the host. That pretty much covers it! Hopefully this will save a fellow virtual admin some headache! I hit so much contradictory information about this and because my PDC emulator is running on Hyper-V it just went around and around, never able to get the time to update. But yes once I cleared the time sync settings on the DCs on my Hyper-V servers I was able to sort the domain time out. Guess the question is.. what kind of risk is involved by doing this? Have you encountered any issues by doing this? 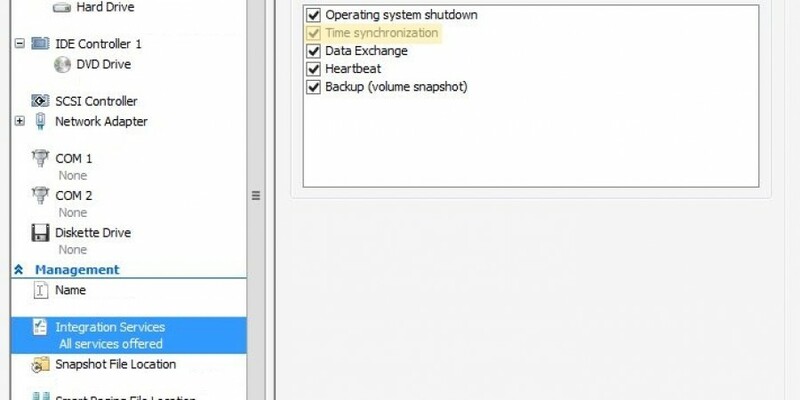 My other option is to shift the PDC emulator role it to a physical DC I guess..
Hyper-V host syncs to the PDC emulator which is a guest virtual machine running on the Hyper-V host and it therefore is trying to sync to the hyper-v host which is trying to sync to it… and around and around it would go I would guess? In my case, my virtualized domain controllers were not hosting the PDC role but the same issue still ensued because they weren’t syncing to the server that was, they were syncing to the Hyper-V host. The Hyper-V host was closes to the Domain Controllers that were virtualized on that host so it was trying to sync to them. Same issue. However if it is the PDC that is virtualized I would guess the issue could become a magnitude or so worse as ALL machines in your domain are going to be affected eventually. So long story short, I think it is safe to say that anytime you virtualize a DC, that option should be turned off. Awesome! Thanks worked for me.